So before Richard distracted us what was the painted sign we were trying to interpret? Lets get back on topic, it wasn't on Penistone Road was it? I was distracted by the word Styring and thought I must post this up - but then distracted again by muffins, beef, red wine and stuff ... sorry. OK I'm with it again. Are the Glass and China part of the same sign as the Merchants bit or has there been some overpainting over the years? 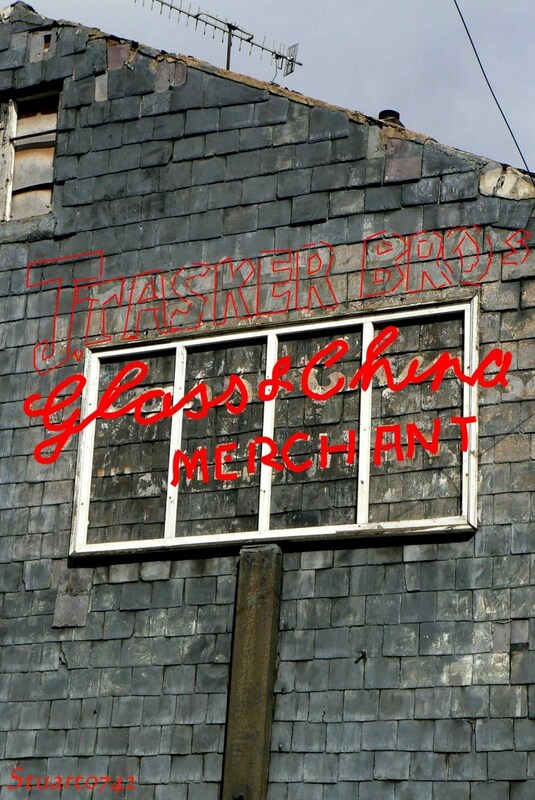 then vox suggested it was Tasker Bros and now that is all I can see it saying,- and very clearly at that. Got to agree with vox's interpretation of all 3 sections of this sign. Been on the wine again have we Richard? Thanks to Richards little digression we now have a whole page of posts (40 of them) and we still haven't got to the bottom of weather it was Taker Bros or not and if they were actually glass and china merchants. No post #40 that I could find. When we finally get back round to it, some of us can actually see painted advertisements, some of them ghostly. The more I look at it the more I think there's something else "underneath" the more obvious writing. This is what I'm sure is there so far. But what's behind I'm still trying to work out. 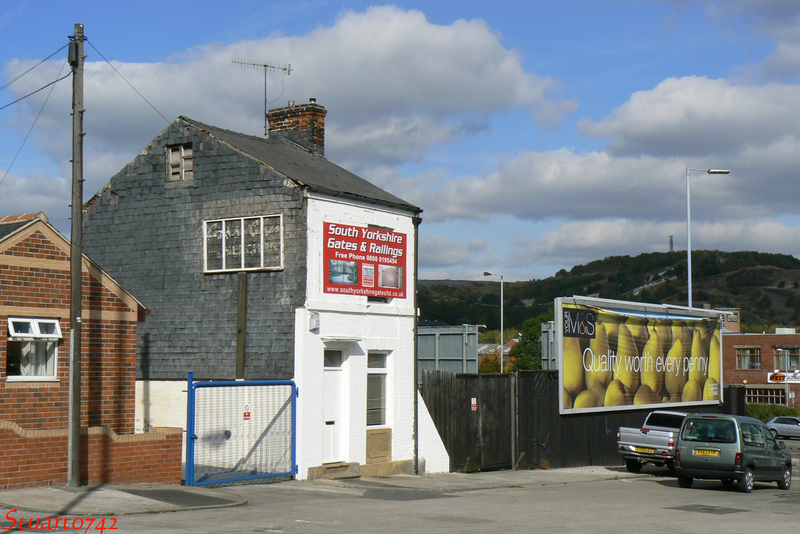 What is that white wooden looking structure, - clearly NOT a window as it has the wall behind it? And what about that vertical piece that seems to be holding it up? It really does get in the way of what we are trying to read. The wooden structure I'd be prepared to bet, is the framework for a later, wooden sign. The upright - Dunno, beats me Dave. 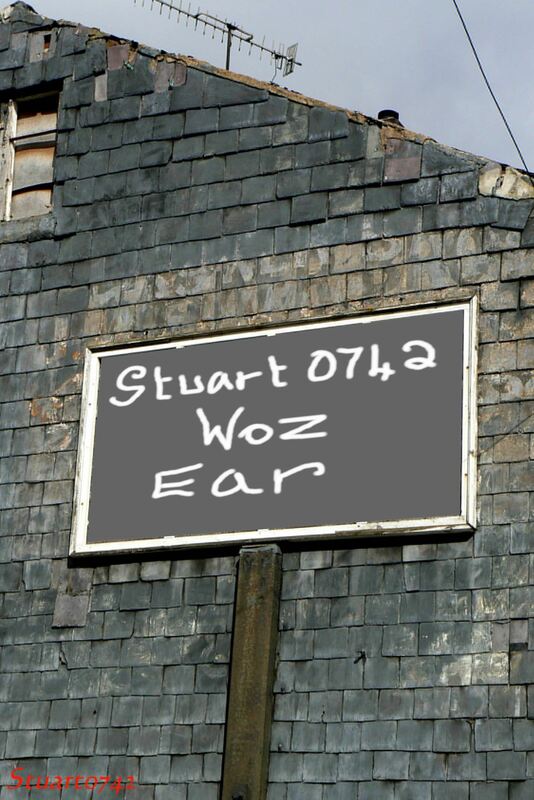 Stuart0742 went to Norfolk School and had Man Wright for English so he can spell reyt propper. 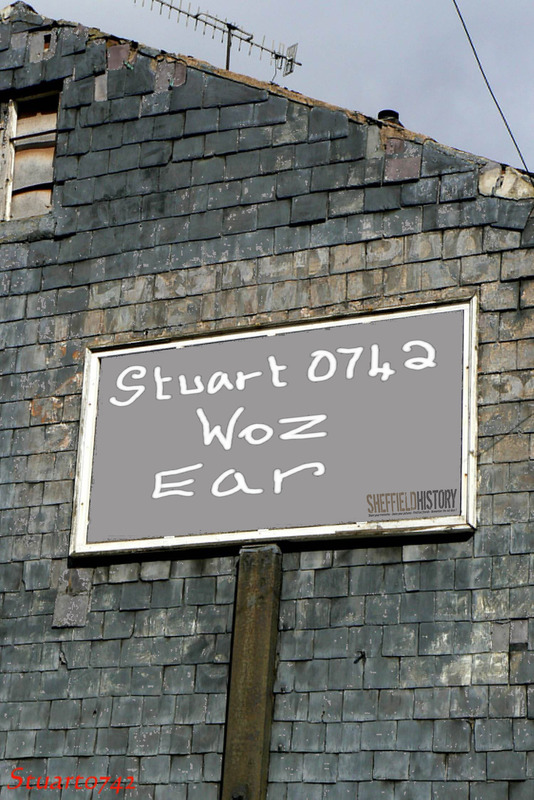 If you are going to write "Stuart0742 was here" on the sign, why do you need to bother with your little red watermark in the bottom left of the picture? 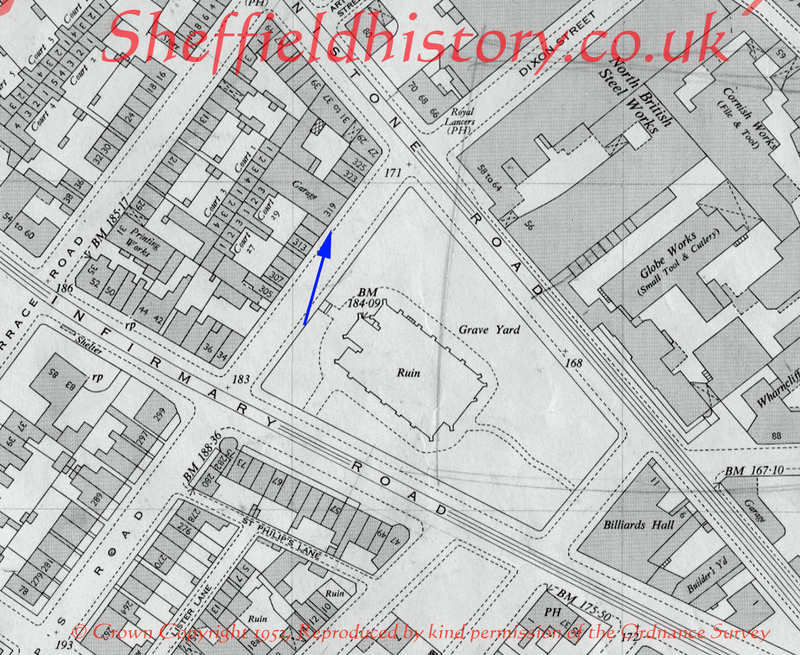 St Philips Road were mineral water manufacturers. That vertical piece was there to stop the wall from bowing out. Attached to it would be a long metal rod that ran under the bedroom floors and conected up to a simillar piece of metal at the other side of the property. Neddy should be able to tell us a lot more about these. So it was a sort of brace and tie rod thing to stop the building falling down then? Interesting, - as although I have come across that in construction before I would have never thought that that is what it was in this picture. I can't remember where or when I took this. 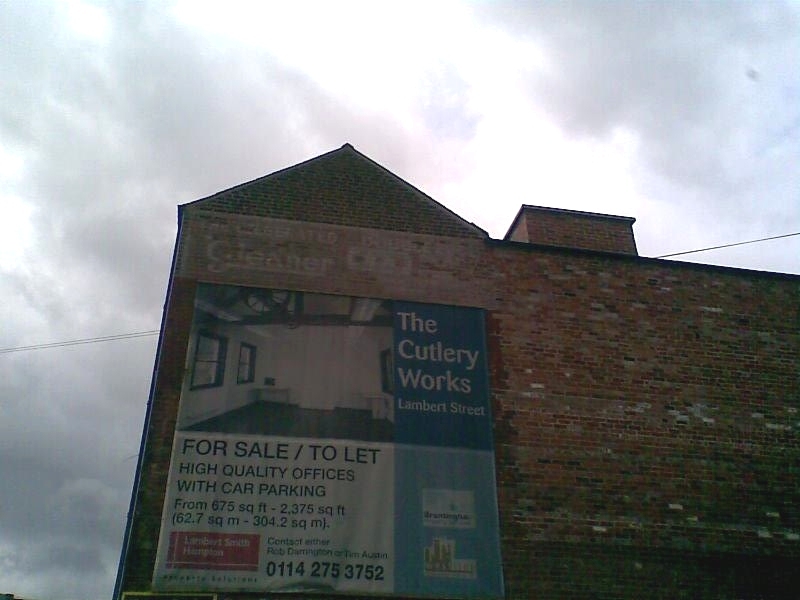 Around Lambert Street by the look of the advert below. It looks to be a razor blade makers sign.